Local multiplayer with friends sitting in the same room as you is better than playing online. There, I said it. Online is fine, but nothing beats sharing an evening of games and fun with your friends and family crowded onto a couch. Local multiplayer went out of vogue for a while, unfortunately, but it is coming back in a big way and we couldn’t be happier. 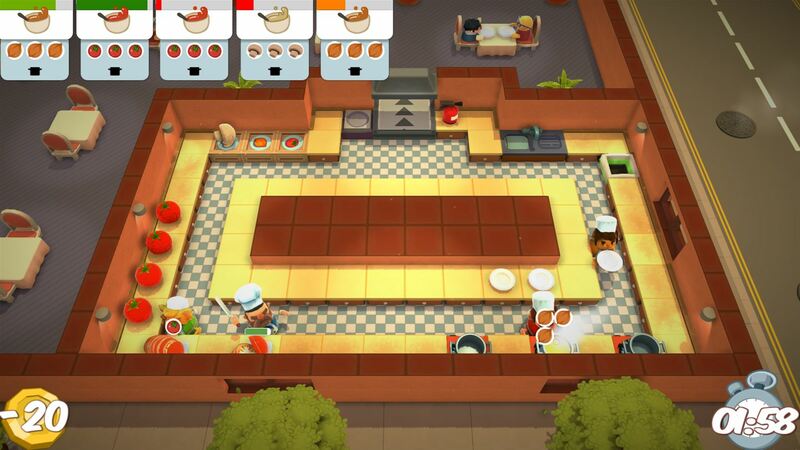 One standout local multiplayer game on Xbox One and PS4 is Overcooked – a cooking game where you have to prepare food for hungry patrons by working cooperatively with your friends. It might not sound exciting, but when you’re fist deep in onion soup while working shoulder to shoulder with your friends Overcooked is a ton of fun. See our full Overcooked review for details. Overcooked is a cooking game where up to four players, local only – no online play at all here – have to work together to prepare and cook food. Each level has a different recipe to prepare as well as unique hazards such as cooking on a moving truck, having countertops that slide around, split kitchens with conveyor belts, rats that try to steal your ingredients, and more. Preparing a given recipe takes multiple steps. First you have to collect the ingredients out of bins and then chop them up on a cutting board. Then you have to put them in a pot or frying pan to cook them. Then assemble them according to what customers ordered, put it on a plate, and send it out to the dining room. You also have to wash the dirty dishes so you can fill more orders, too. Delegating tasks and working cooperatively with your friends is the only way to get anything done in Overcooked, and that is where all of the fun comes from. Everyone has a job and when you are all working quickly and properly you can accomplish great things. It doesn’t always work out that way, though, which leads to folks getting a little bossy and yelling at people like you’re Gordon Ramsey and the game gets even crazier and intense and more fun. As long as nobody actually gets mad, that is. When you do work together and it all works smoothly, Overcooked is one of the most satisfying party games you’ll ever play. 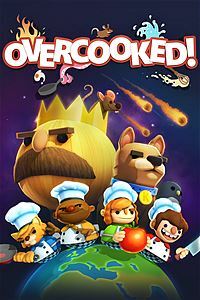 I think it needs to be emphasized that Overcooked is a multiplayer party game first and foremost. It can be played solo, but the implementation is absolutely terrible and borderline unplayable as the game makes you switch between two characters and keeping track of everything and actually doing it all fast enough by yourself is almost impossible. The game doesn’t make any concessions to make it easier for a solo player, either, so you’ll hit a wall and not be able to advance after just the first couple of levels. Don’t buy Overcooked if you can only play solo. It just doesn’t work. Honestly, two players is almost not enough to play Overcooked properly, either. You can get a lot further than a solo player with just two players working together, but eventually you’ll hit challenges that you just can’t do fast enough so you won’t be able to earn enough stars to unlock new levels. Playing with two players is definitely still a lot of fun, though, so even if you might not be able to see everything the game has to offer, you can play for several hours and have a good time. Just keep in mind that the game is at its best with 3-4 players, but it is still totally worth a look for a party of 2. 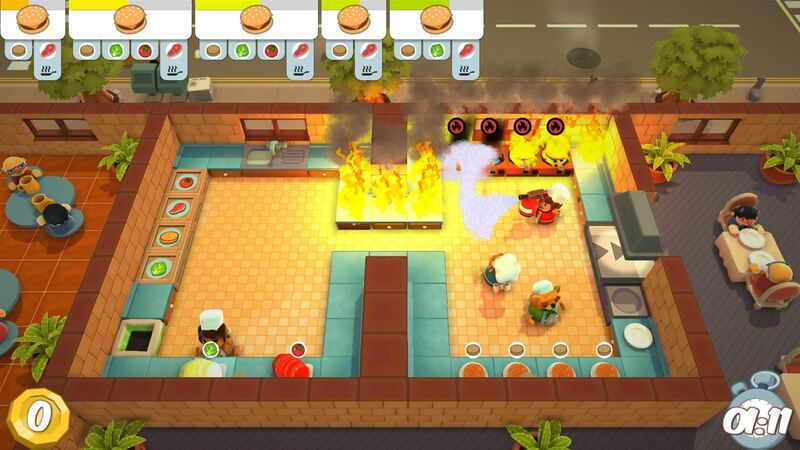 One thing that makes Overcooked a good party game is that the controls are very simple and your tasks are so rooted in reality and obvious – everyone knows you have to chop stuff up and cook it and wash dishes, right? – that the game is pretty easy to pick up even for non-gamers. The whole family can play and yell at each other, and that’s always fun. The presentation in Overcooked is quite appealing with a clean design that makes it easy to tell what is going on and what you need to do. It does a good job giving you clear visual information about what orders you have to fill and what the status of a particular plate is, so as long as you’re paying attention it is easy to keep track of everything. The character models for the chefs are also very cute and cool with our favorites being a cat and a raccoon in a wheelchair. Why a raccoon in a wheelchair? Because of reasons! If you have a group of friends and family that come together to play games pretty regularly Overcooked is easy to recommend. It is a great easy to pick up and play party game for gamers and non-gamers alike that is a ton of fun. Buy it.